A successful 12th Edition with 4 screenings sold out. 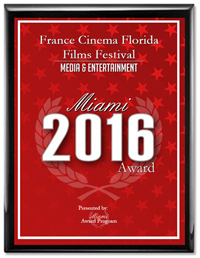 France Cinema Floride Films Festival is among a very small group of companies that have won the Miami Award for two consecutive years. 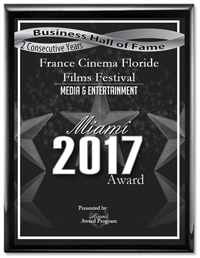 This distinction has qualified France Cinema Floride Films Festival for the 2017 Miami Business Hall of Fame. Our annual rendez-vous in Miami for the 11th FFC Festival took place in MDC Tower Theater with 3 SOLD OUT screenings, the very popular Penny Pincher (Radin), Back to Mom's (Retour chez ma mère) and My family already adores you (Ma famille t'adore déjà). 1940 fans were present at the screenings over the weekend November 4-6, 2016. The 10th FFC Festival held in MDC Tower Theater hosted 2180 fans over the weekend, November 6 to 8, with 3 SOLD OUT screening for Boomerang, Floride, and Aladdin. Over 700 spectators came to cheer and talk with our guests. Our young audience were happy to get a session of photos and autographs with rising star Kev Adams. 2 SOLD OUT screenings for the very popular Serial (bad) wedding (Qu'est-ce qu'on a fait au bon dieu ?). 2250 fans were present at the screenings over the weekend Oct 31 - November 2. 8th annual FFC Festival took place in Miami and Derrfield in November 2012. 4 SOLD OUT screenings in MIAMI (Tower Theater): Big is Beautiful (Mince alors), The Belgian Job (Il était une fois une fois), and twice for What's in a Name (Le prénom). 2 SOLD OUT screenings in DEERFIELD (Paragon Theater): What's in a Name (Le prénom), and Big is Beautiful (Mince alors). Almost 4250 fans were present at the screenings for our 2012 selection. Together we made these film festivals an unparalleled cultural success, exceeding last year's attendance. 7th annual Rendez-vous with FCF in Miami, November, 4, 5, 6. Miami audience was at the rendez-vous to host the 2011 movie selection, which made 5 movies sold out over the weekend. Audience was also delighted to meet Actor Pascal Elbé in a one-hour Q&A about his leader role in R.I.F. A big Thank you! to our sponsors, and for continuous support from major media outlets. Our 6th annual Rendez-vous du Cinéma français en Floride in 2010 was again a great success, thanks to your support! FCF 6th edition's movie selection was received with enthusiasm by an audience of nearby 6,000 over the two weekends. La tête en friche (My Afternoon with Marguerite), starring Gérard Depardieu and Gisèle Casadesus, made full house in each of the three screenings. Presenting two festivals in Florida - Miami and Boca Raton. For this 5th Edition , we had the pleasure to welcome Script Writer and President of the French Writer Guild Jérôme Soubeyrand. France Cinema Floride - The meeting place for great French films - was officially saluted for presenting two festivals in Florida - Miami and Boca Raton - continuing pursuit of its mission to strengthen the cultural bridge between French language and culture and the US through cinema, by the Mayor of the City of Miami Manuel Diaz on November 6, 2009. In 2008, after growing success since 2005, France Cinéma Miami becomes FRANCE CINEMA FLORIDE and is now presenting two festivals in Florida - Miami and Boca Raton. In this 4th Edition, we had the great pleasure to welcome writer/director/actor Dany Boon, for the presentation of his successful “Welcome to the Sticks”, seen by over 20 million people inFrance. Among our guests were also Kad Merad (actor), Eric Hubert (executive producer), Frédéric Berthe (writer/director), Philippe Muyl (writer/director), Mélanie Doutey (actress). The movies were shown at AMC Cocowalk in Miami and Sunrise Mizner Cinema in Boca Raton, and “Welcome to the Sticks” made full house in both theaters. In November, the 3rd Edition of our 3-day « France Cinéma Miami (FCM) film festival » hosted French movie industry representatives and had the support of major media outlets. It was a pleasure to have the presence of Mr. Franck Mancuso (Director), Mr. Philippe Muyl (Director) and Mr. André Lazare (Producer and Distributor). It took place at the Coconut Grove AMC Theater (4,000 seat capacity) with an 85% occupancy rate. The French Gala Souper after the Opening Night movie “Counter Investigation” was sponsored by the Miami French Consulate. 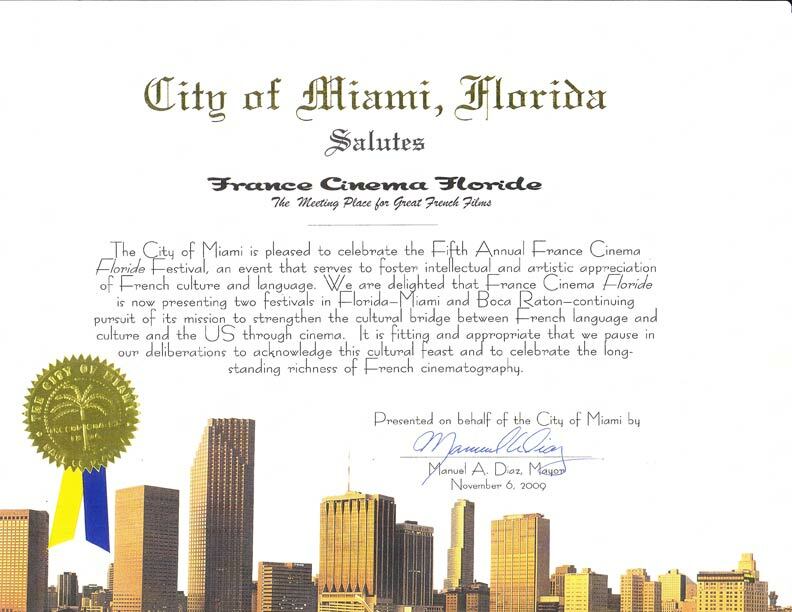 FCM was officially saluted for "serving to foster the intellectual and artistic appreciation of French culture and Language in South Florida" by The Commissioner of the City of Miami Marc Sarnoff on November 9, 2007. 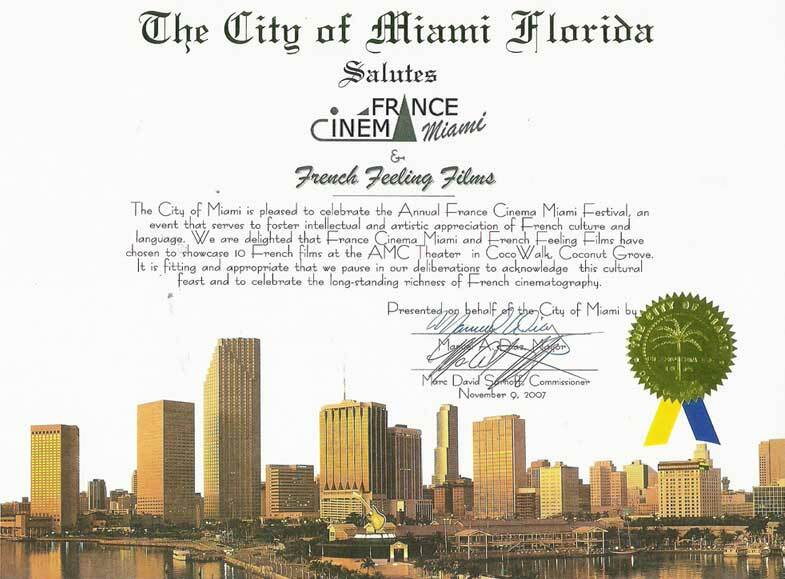 The Second Edition of France Cinéma Miami was held on November 9, 11 and 12, 2006, welcoming a greater number of spectators than the previous year. 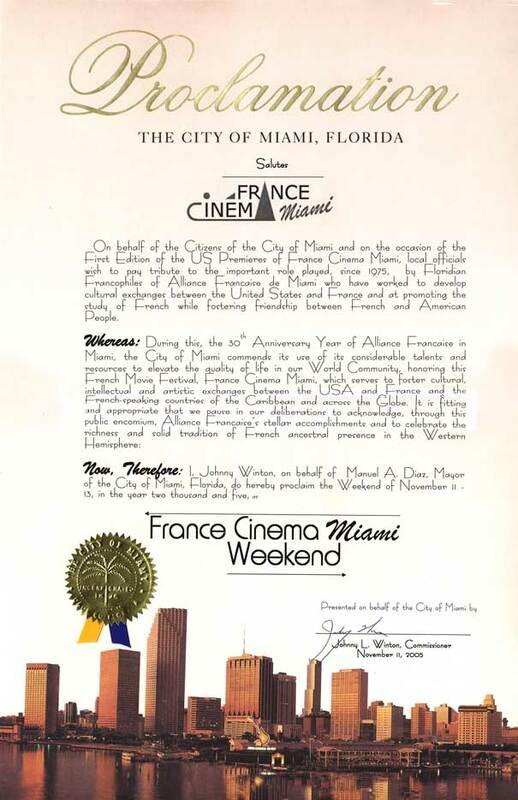 During these 3 days, France Cinema Miami attracted no less than 3,350 spectators, during which the Floridian public were able to discover 10 movies in French with English subtitles. Among them were 2 World Premieres: the Opening Night movie “The big apartment” by Pascal Thomas, sponsored by City Bank, and the Closing Night movie “Bad faith” by Roschdy Zem, sponsored by the French Consulate in Miami. It was a pleasure to have the presence of Ms. Sandrine Butteau (Attachée for the Audio Visual office of the French Embassy in Washington), who was pleased to join us, and could notice the strong interest aroused by the French cinema in the United States and more particularly in Florida. The First Edition of our 3-day French movie festival, taking place in Coconut Grove AMC Theater in November 2005, featured ten 2005 movies, all US Premiere, and hosted French movie industry representatives. 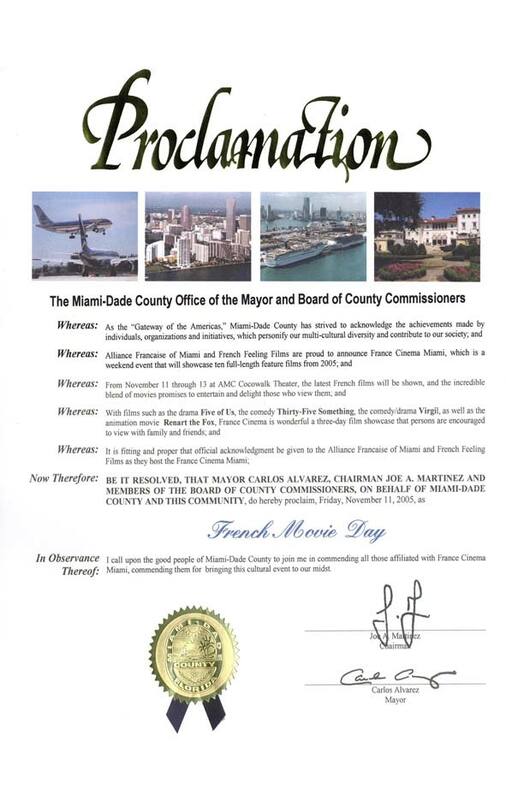 The various activities and events organized during the festival - from the Panel Discussion to the French Gala Souper - contributed to the great success of this new annual cinema meeting place in South Florida (3,000 visitors), which was officially named as "the French Movie Week in Miami" by The Mayor of the City of Miami Manny Diaz on November 11, 2005.